Home» AP LATEST UPDATES » AP MDM Workers one day Strike notice Necessary Instructions DEOs as per Rc.No 224. AP MDM Workers one day Strike notice Necessary Instructions DEOs as per Rc.No 224. AP MDM Workers one day Strike notice Necessary instructions to DEOs to take required measures for supply of MDM to the students as per RC.NO:224,Dated:18/01/2018. AP School Education Mid-Day Meal Scheme Strike notice issued by MDM workers One day strike on 23rd January 2018 instructions to DEOs to take required measures for supply of MDM to the students as per Rc.No.224/MDM/2018 Date:18-01-2018. Strike Notice dt:02-01-2018 issued by MDM Workers Union. The attention of all the District Educational Officers in the State is invited to the references read above and they are informed that the Andhra Pradesh Mid-Day Meal Workers Union in their strike notice read above has informed that they are going on one day strike on 23. January 2018 on certain demands. The DEOs are informed that the demands of the Union are policy issues and, thus, Government have to take decision keeping in view the budget constraints. Therefore, the demands of the MDM Workers Union will be brought to the notice of the Government to find a solution. 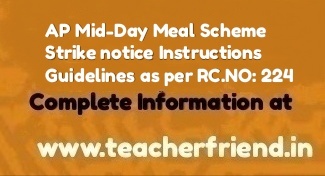 Ensure that there shall be no disruption in supply of Mid-Day Meal to the students on that day. Issue necessary instructions to the Head Masters/ Mandal Educational Officers to engage volunteers, in consultation with the School Management Committ0ee, to cook 86 serve MDM on 23rd to the students as usual. Take required steps to convince the MDM Worker Unions to call off the strike and solve their demands through applications/ talks within the rule frame. Get Download Complete Information Click Here.